First load the package. We also load several other packages to help quickly explore the data. Get TB burden data with a single function call. This will download the data if it has never been accessed and then save a local copy to R’s temporary directory (see tempdir()). If a local copy exists from the current session then this will be loaded instead. The WHO provides a large, detailed, data dictionary for use with the TB burden data. However, searching through this dataset can be tedious. To streamline this process getTBinR provides a search function to find the definition of a single or multiple variables. Again if not previously used this function will download the data dictionary to the temporary directory, but in subsequent uses will load a local copy. We might also want to search the variable definitions for key phrases, for example mortality. Finally we could both search for a known variable and for key phrases in variable definitions. 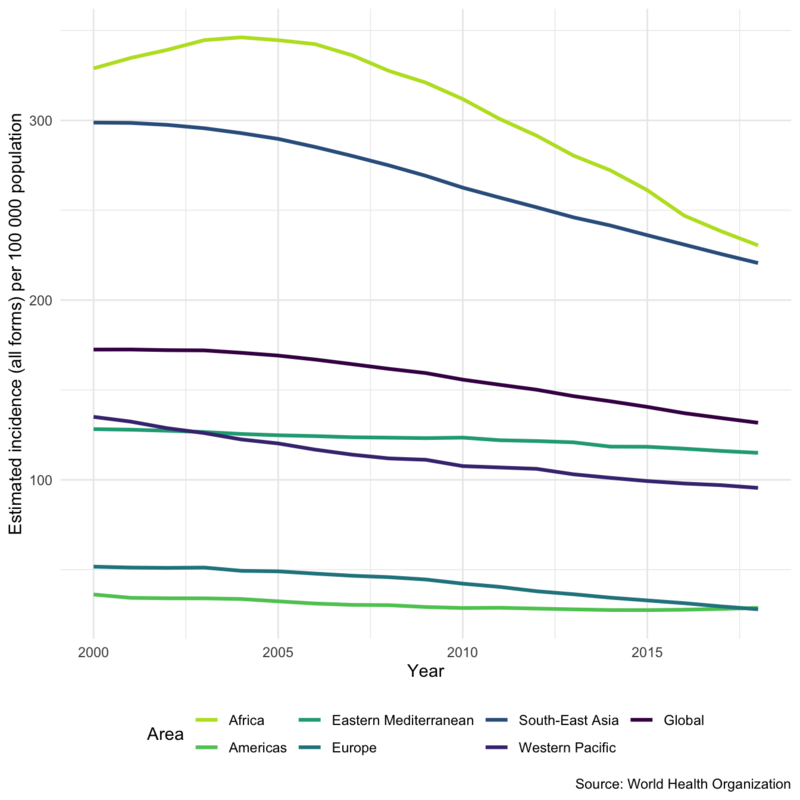 To start exploring the WHO TB data we map, the most recently available, global TB incidence rates. Mapping data can help identify spatial patterns. 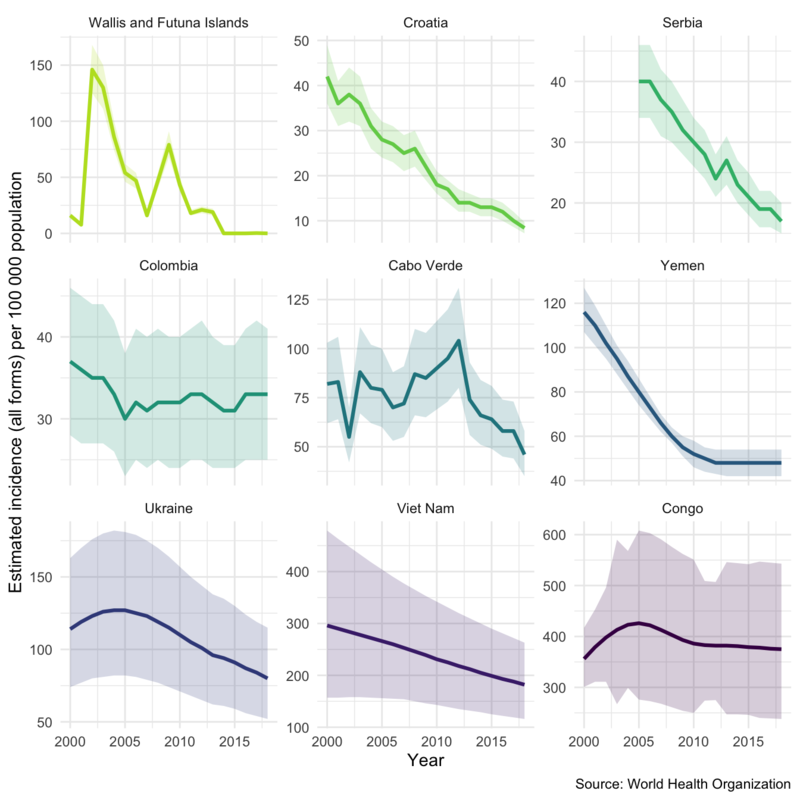 To showcase how quickly we can go from no data to plotting informative graphs we quickly explore incidence rates for all countries in the WHO data. Another way to compare incidence rates in countries is to look at the annual percentage change. 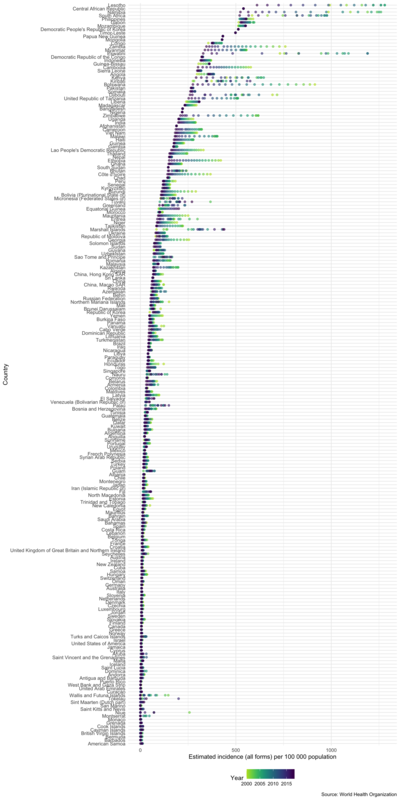 The plot below only shows countries with a maximum incidence rate above 5 per 100,000. 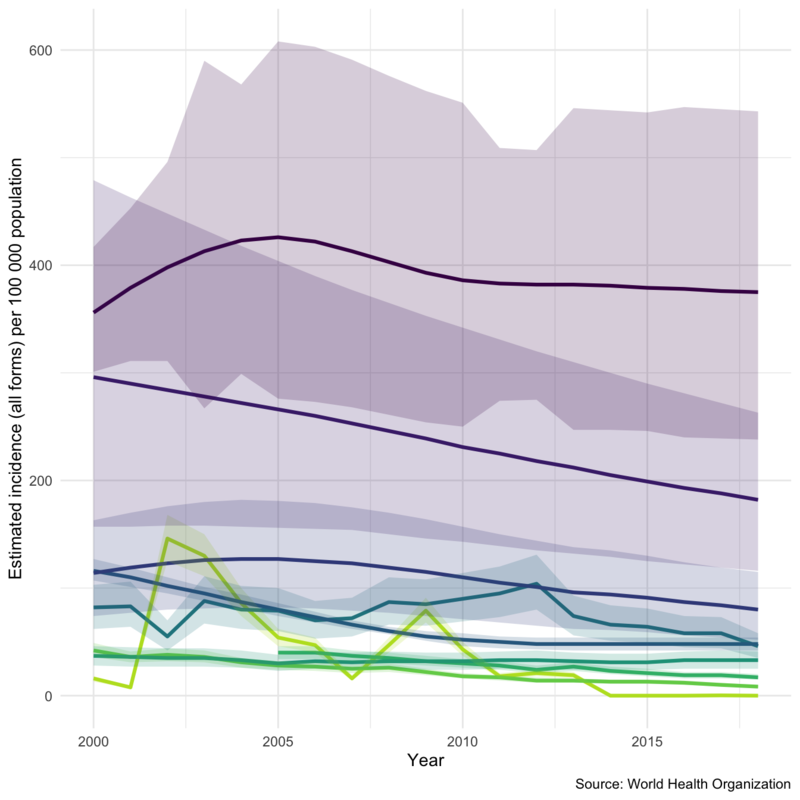 We might also be interested in getting a regional/global overview of TB incidence rates (Hint: Use search_data_dict to look up e_inc_100k to see what role this is playing here). See ?plot_tb_burden_summary for more ways to summarise TB metrics. 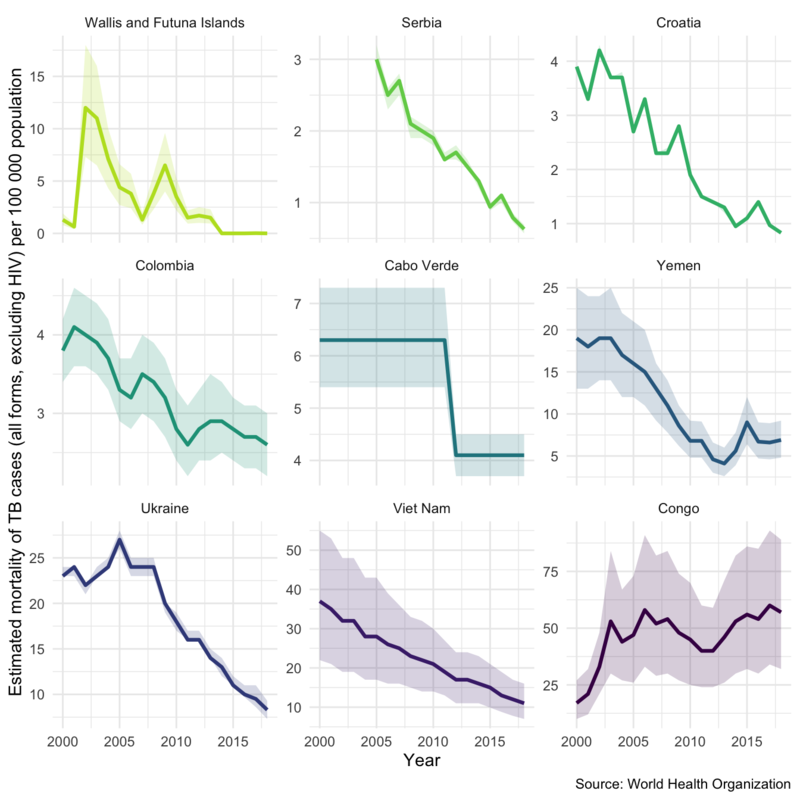 Diving deeper into the data lets plot a sample of 9 countries using the inbuilt plot_tb_burden function. Again plotting incidence rates, but this time with 95% confidence intervals. As you can see this isn’t a hugely informative graph. Lets improve it! We have faceted by country so that we can more easily see what is going on. This allows us to easily explore between country variation - depending on the sample there is likely to be alot of this. 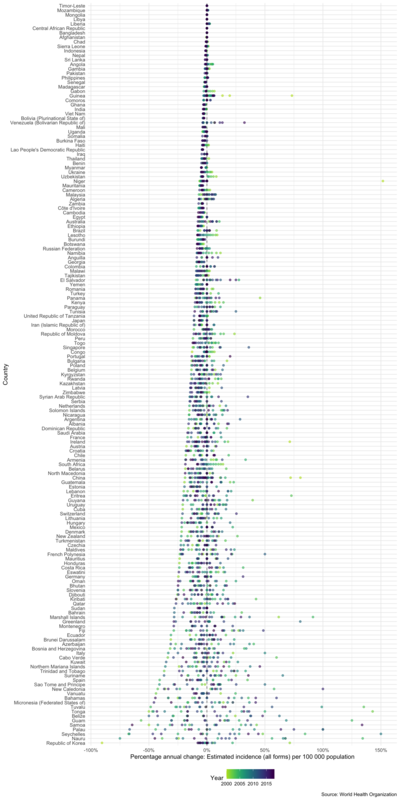 To explore within country variation we need to change the scale of the y axis. We might also be interested in mortality in both HIV negative and HIV positive cases in our sample countries. We can also look at this using plot_tb_burden as follows. Note we can do this without specifying the TB burden data, the plotting function will automatically find it either locally or remotely.